To help train teachers to teach with technology and implement latest learning skills in the classrooms of four schools in a rural area southeast of Nairobi, Kenya, Fraserview Rotary and 30 other BC Rotary clubs in Rotary District 5040, with a grant from the international Rotary Foundation, sponsored a team of BC educators to share knowledge with teachers in four schools southeast of Nairobi, Kenya for two weeks in Spring Break with additional funding through a global grant from the international Rotary Foundation. Our club sponsored Andy Beadon. 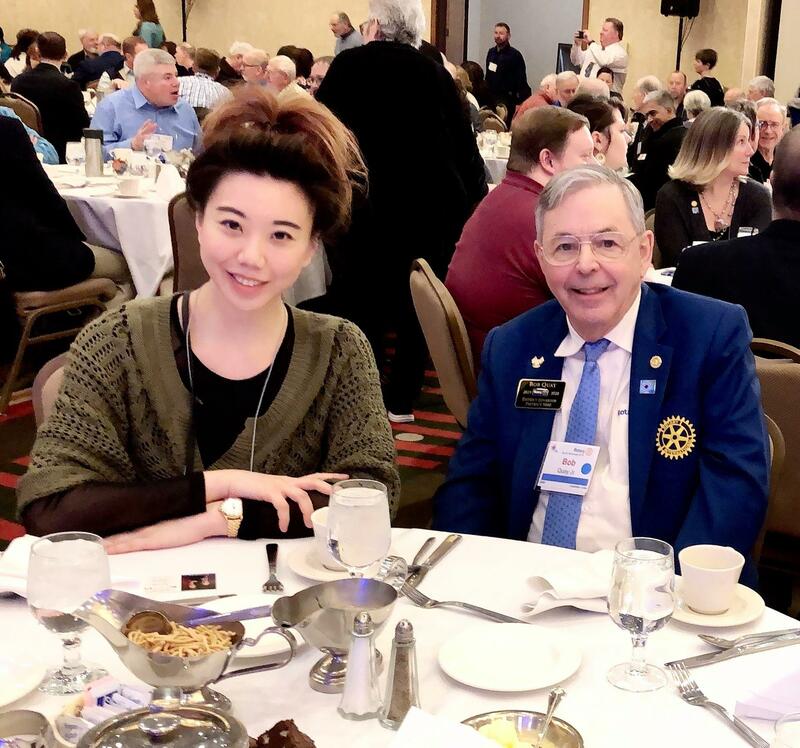 Rotary Club of Burnaby Metrotown and Rotary Club of Vancouver Fraserview sponsored Alexa Mira Society which focus on Rotary 3 areas of focus: Maternal and Child Health; Basic Education and Literacy; and Economic and Community Development. 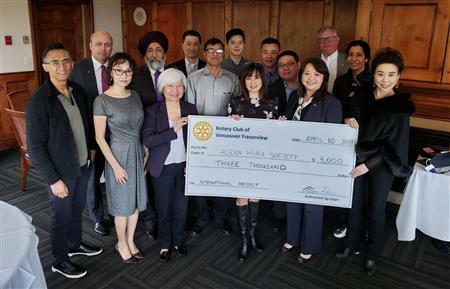 Rotary Club of Vancouver Fraserview sponsors John Oliver Interact Club. A $500 check was presented to them at Charity Gala to assist with their club's community project. Our club also sponsored two interact club members to Interact Conference on November 3, 2018. Rotarians are business and professional leaders who take an active role in their communities while greatly enriching their personal and professional lives. Our mission is to provide service to others, promote integrity, and advance world understanding, goodwill, and peace through our fellowship of business, professional and community leaders. A big thank you to Immediate Past President Manjit Claire for recommending this restaurant to our club for our holiday season dinner celebration. In attendance were 18 members and family members of our Rotary Club. It was an amazing night that started off with a delicious dinner selection of different dishes, and was followed by an evening of music and dancing. It was very evident that our party came with their dancing shoes on. There were countless highlights including the incredible dance moves of Past President Dalip Sandhu to President Elect Kuldeep Tatla inspiring everyone in the restaruant to come to the dance floor and have a dance. What a night!! I heard many coments of when can we do this again and why haven't we come to this restaruant before!! An evening enjoyed by all and truly celebrated in the Rotary Spirit. Our club definitely left our mark at this venue by having an absolute blast! Happy Holidays to all and the best for 2012! The Rotary Club of Vancouver Fraserview held it's annual Fundraiser on Saturday Nov 5, 2011 at the fabulous Royal King Palace Banquet Hall at Payal Business center. A big thanks to partners Parminder Atwal and karan Khatkar. We enjoyed another successful year as we raised proceeds of $49,000. We again met our goal to committ $20,000 per year to the BC Mental Health Foundation. The monies raised go towards a unique and innovative program called "The Youth, Culture and Mental Health Fund which is headed by Dr Shimi Kang. Our Club has made a $100,000 commitment over 5 years to this cause. Young people between the ages of 15-24 report the most suffering from Mental Illness, Substance abuse, and Addiction. Dr Shimi Kang, who has worked with youth for over 10 years, has observed that all youth, including South Asians are at serious risk. Culturally specific awareness, education, and intervention at an early stage are key facors in keeping our young people healthy and communities thriving. The evening was enjoyed by about 250 people in attendance. Entertainment was started off by Neeraja Aptikar who provided a great selection of Classical Indian songs. She was followed by Rajdeep Sekhon whose bollywood singing voice was as if we were listening to the original singer of the song's. Dal Hothi then came on and rocked the night. The dance floor was packed and many interesting and fun dance moves were witnessed by all. The evening was MC's by Comedy Central Comedian Sunee Dhaliwal and his co-host John Perrotta. Both provided a a fun filled evening with timely jokes and a nice flow to the evening. The Club had a surprise and generous donation made by Bruce Kehler and Scott Frampton whose company Country Lumber presented a check for $5500.00 . The unexpected donation was accepted by Club President Bob Rai and the two were asked to come to the stage and say a few words. As well two key member's our club were presented with the Paul Harris Fellowship Award. Immediate Past President Manjit Claire and Bruce Kehler were the recipients of this prestigious award which is given by Rotary International. 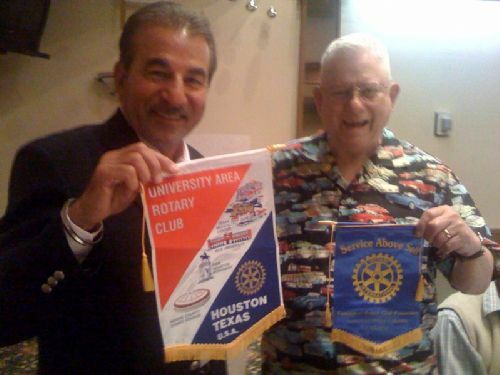 Congratulation's to both of them for their commitment to Rotary and thier generous contribtions. The evening's fundraising activities were also well received. The Silent Auction items completely sold out. The balloon sales to win a trip for two to stay at the Trump Tower Hotel In Manhatten, New York (donated by Kuljit Tmana) also sold out and the Live Auctions items provided some exciting bidding wars. A slice of pizza that was donated spontaneously by Dave Atwal ended up going for an amazing $700. Thanks to Dave for starting this creative and spontaneous auction item. As destiny would have it his partner Dana Purington of DSM Civil Works ended up winning the Trump Tower Hotel Prize. As well Narinder Kang and Jason Hari won a bid of a extemely generous $3000 for a hockey game package that included two tickets to a Canucks Game of their choice donated by The Medicine Shoppe Pharmacy, A limo ride provided by Star Limo(Ranjiv Sandhu) and a tunnel pass to meet the players after the game donated by The Fan Zoo(Bob Athwal). All in all the evening was enjoyed by everyone. A big thank you to everyone for their generous support and congratulations to the Vancouver Fraserview Rotary Club on another well done event. A special thanks to President-Elect Kuldeep Tatla, Immediate Past President Manjit Claire, Treasurer Mercedes Wong and Secretary Anita Dalakoti for helping to put together the details of the event and making it wonderful evening. Rotary Club of Vancouver Fraserview Rotary "Bowling Night's"
Rotary Club of Vancouver Fraserview was privileged and honored to have as it's special guests speaker's at today's lunch the newly appointed Commanding Officer of the British Columbia Regiment Lt. Colonel Harjit Sajjan and Colonel Keith Maxwell. Both men have served our country proudly and have achieved high levels of success. Our Rotarians enjoyed hearing about their accomplishment's as well as sharing some of the old war stories. It was very interesting and exciting to hear them speak about their experiences. The Club was so enthused about their visit that our newest member Jesse Johl made a motion to give them honorary membership in our club. This motion will be formally passed at our next rotary meeting. Please click on their names to read their bio's. A must read as both are very accomplished. Of course, a special congratulation's to Lt. Colonel Harjit Sajjan who had his Change of Command Parade on a very special date: Sept 11, 2011. It make's it even more special as he had a large part in turning things around in Afhganistan with his unique approach on building relationships and building communities from the ground up in a war torn nation. Thanks to both gentlemen for making our meeting memorable. Thank you Volunteers, Golf Tournament Participants, and the staff at Greenacres Golf & Country Club. What an awesome event! This year the Rotary Club of Vancouver Fraserview, once again hosted their annual golf tournament, in which the club raised twice as much money as the previous year, and enjoyed a wonderful day of Texas scramble golf with over forty five participants. This year’s event was further endorsed by twenty six corporate hole sponsors, that generously donated to the hosting of the Fraserview Rotary Club's annual golf tournament. Each attendee also went home with a prize, either from the silent auction tables, the many free giveaways, and of course the player gift bags. We welcome all participants to enjoy this annual event once again in 2012, and would like to thank you for your continued support. The Rotary Club of Vancouver Fraserview enjoyed an absolutely beautiful evening aboard a 144ft yaht and enjoyed a dinner cruise that ended with a spectacular view of the Vancouver International Fireworks competition out in the middle of english Bay. On this night Spain was competing and the 25 people attending enjoyed the evening that was full of food, drinks and a great company of people. The yaht was rented through Accent cruises and we thank them for giving us a Rotarian discount and taking superb care of all that were aboard. Rotarians and their families gathered to hold our Annual BBQ in South Vancouver at South Fraser River Park on Sunday July 17,2011 The day was a bit cloudy and had splashes of rain but was the mood was uplifting and the food that was prepared by Rotarian and Seargent at Arms Harinder Dhillon was absolutely spectacular. The food really brought the sun out in our hearts and the setting was beautiful as we enjoyed the great food and beverages alongside the Fraser River with a view on airplanes landing at YVR. A big thanks to Harinder for putting this event together and to Rotarian Vish Chandra who assisted Harinder as co-Chair of the event. The crowd was delighted to also feast on a special goat curry that was specially prepared by Rotarian Narinder Sidhu's wife Harpreet. A big thanks to her also. Later in the day a card game called "seep" broke out and a guys against the ladies game ensued. We won't mention who won the historic battle. :-) To end the evening the Club enjoyed birthday cake after singing a rousing rendition of Happy Birthday to Ethan Claire, son of Past President Manjit Claire and Former First lady Ronnie Claire. A big thanks to Rotarian Narinder Sidhu for coming up with the suggestion to have tent's in case the weather didn't hold up and a big thanks to Rotarian Ajit Thandi for getting the Tent's organized. All in all everyone enjoyed themselves and was a great day. Kalyan Banerjee, a member of the Rotary Club of Vapi, Gujarat, India, since 1972, is the selection of the Nominating Committee for President of RI in 2011-12. Banerjee becomes the president-nominee on 1 October if there are no challenging candidates. "ADDICTION & MENTAL HEALTH ISSUES IN THE SOUTH ASIAN COMMUNITY"
The Legacy Project is a community event that invites all cultures to come together with one goal. The united goal is to honor and respect our diversity and appreciate the countless benefits of living in Canada . What better way to teach our next generation of children this, than through the sharing of Family Legacy stories. At the same time, students are getting an opportunity to experience the many stages of publishing a book. We hope to motivate and foster many future writers. We Need to Raise $6500 for this Project. Barj Dhahan, Deputy Director, Community Projects Committee who is one of the organisers for the Cops for Cancer Fundraiser, invites all Rotarians and members of the public at large to come together and support this just cause on September 25, 2009. For registration information click on the link below. President Elect Manjit Claire has been inducted into the Board of Directors of the BC Cancer Foundation. On August 19, 2009 at a ceremony held at the Samosa Garden, the new Board Members of the Rotary Club of Vancouver-Fraserview were installed by PDG Chris Offer & DGE Penny Offer. DGN Hans Doge inducted the 3 new members, Rotarian Jaswant Bains, Rotarian Jaswant Sran & Rotarian Jatinder Sharma to the Club. On Wednedsay August 19, 2009 the Rotary Club of Vancouver-Fraserview will be holding a dinner celebration at the Samosa Garden in Kingsway, to celebrate the induction of the 2009-2010 Officers & Directors of the Club. Kalyan Banerjee, a member of the Rotary Club of Vapi, Gujarat, India, since 1972, is the selection of the Nominating Committee for President of Rotary International in 2011-12. Banerjee will become the president-nominee on 1 October if there are no challenging candidates. Building fellowship among the members of the Rotary Club of Vancouver-Fraserview and their friend's and supporter's. The Basics of Robert's Rules of Order : In order to conduct an orderly meeting, with everyone getting a chance to express their opinions, it would be in order to follow the rules of conduct as prescribed in the Robert's Rules.